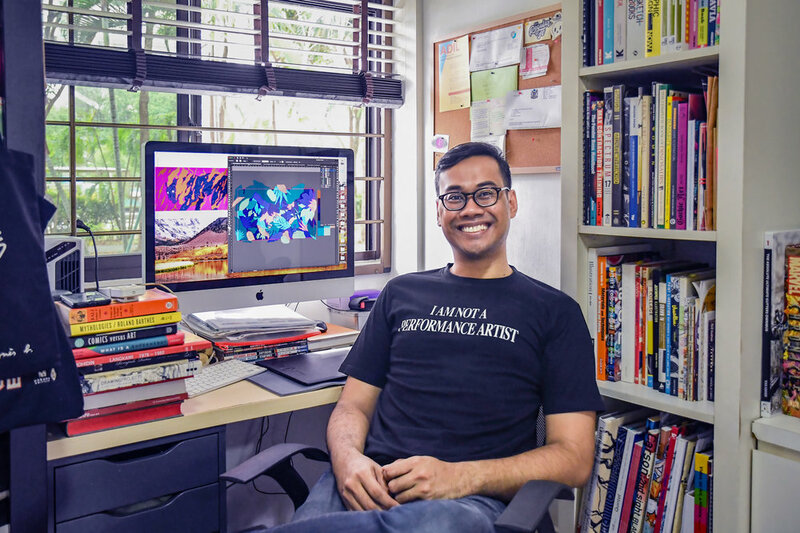 A graphic designer by training, Muhammad Izdi (b.1986) graduated from Singapore Polytechnic in 2007, and cut his teeth as the lead designer for contemporary art institution, the Singapore Art Museum (SAM). From 2010 to 2013, as SAM’s Senior Designer, he conceptualised and executed its visual communications across the gamut of branding, marketing and advertising. He oversaw the design of exhibition brochures, catalogues and advertisements, amongst other collaterals, as well as larger-scale onsite exhibition graphics for the Museum’s galleries and external venues. 2014 marked an important period for Izdi as he decided to pursue his interest in art. In his efforts to evolve from a designer to an artist, Izdi has taken part in two international exhibitions as part of the Singapour en France - le Festival; Art Garden (2015) at Gare Saint Sauveur, Lille and Open Sea (2015) at Musée d’art contemporain de Lyon. Izdi has also participated in the Dena Foundation Artist Residency Program in Paris where he stayed for three months developing his art practice and research. In 2017, Izdi had his first solo show The Brown Dabble at Chan + Hori Contemporary gallery in Singapore.